Alas, today marks the first day of Spring, which means we’ve seen the last of icy windshields, early sunsets, and cold hands. (Hopefully) Instead, us Marylanders can look forward to replacing a winter coat for a sweatshirt and a scarf for a pair of sunglasses. And, what better reason to celebrate than with a new brew on a sunshiny day? Without further ado, we’ve got 5 beers you should try this Spring. What recently seems to be a very popular beer, Allagash White has actually been around since 1995. Although brewed in Portland, Maine it has roots in Belgium. This complex yet refreshing brew is a surprising favorite amongst many beer enthusiasts and just beer lovers alike. Allagash is spiced with coriander and Curaçao orange peel for a fruity taste and a spicy finish. This traditional Belgian wheat beer is available year-round too. However, it’s the perfect brew for sipping on and even bringing to a party to share with friends. Another North Eastern beer, the Truly Spiked & Sparkling Hard Seltzer is not your average beer. This Boston brew has a bubbly mouthfeel and crisp, clean finish. Truly Wild Berry is poised to be the drink of the spring and summer season. This will pair well with spicy BBQ and beach days. Not to mention, with only 100 calories and 1 gram of sugar, there’s nothing to feel guilty about. We are all for local brews. Union Craft Brewing in Baltimore has a Double Duckpin that is a nice pale ale. It features juicy hops, a slightly hazy deep gold color, and a smooth finish. Upon the first sip of the medium-bodied Imperial IPA, you’ll notice a hint of grapefruit, lemon zest, and pineapple flavors. All in all, you may be hard-pressed to find a better double IPA, let alone one in Maryland. Try Double Duckpin at Chad’s and see why it’s considered one of the top 50 craft beers in the country. If the label doesn’t catch your eye, then the taste will. Made with Rogue’s signature “PacMan” ale yeast, the malt-forward flavor of Dead Guy Ale may remind you of the sweet smell of raisin bread. Available year-round, this German-style Maibock features a sweet, malty aroma and a rich, hearty flavor with a bitter hop. Interestingly, Dead Guy Ale was started in the early 1990s as a celebration for the Mayan Day of the Dead. It’s not October, but still well worth a springtime sip. Rounding out our list of beers, you should try this Spring is Country Ride. Brewed in Cambridge, Maryland, RAR’s Country Ride features unique piney and grapefruit aromas thanks to the use of whole-cone American hops. Among tastes of citrus, floral notes, and stone fruit, you can expect a good balance of malt and hops. This Maryland brew is a perfectly-balanced warm weather APA. Even more, Country Ride is one of RAR’s most popular beers, hence their decision to make it a year-round brew. 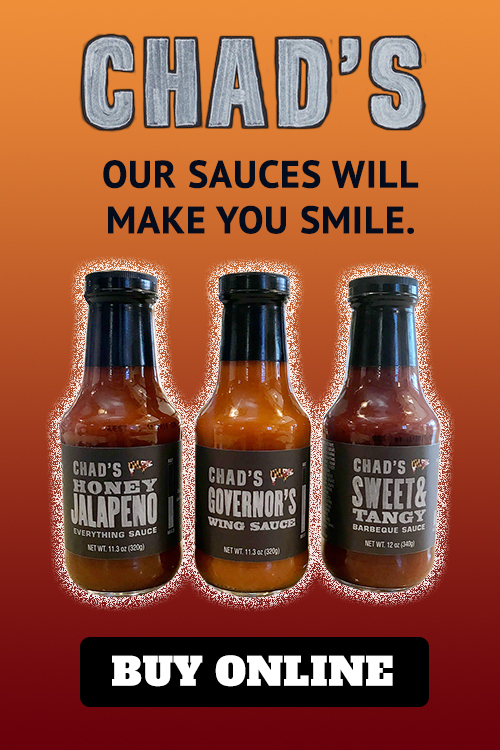 Celebrate the arrival of the sunny season when you visit Chad’s BBQ. We rotate our seasonal brews every few weeks, so stop by and see what’s new. Enjoy the warm weather, delicious BBQ, and cold beer at Chad’s this Spring.